The Chennai Super Kings notched up their second win of VIVO IPL 2019 when they defeated the Delhi Capitals at the Feroze Shah Kotla ground in Match 5. MS Dhoni’s side did extremely well to restrict the hosts to 147-6 after the CSK batsmen chased down the runs in 19.4 overs. CSK won by 6 wickets. In the evening, it took the maturity of Shikhar Dhawan and cameos from Prithvi Shaw (24 from 16 balls) and Rishabh Pant (25 from 13 balls) to guide the Delhi Capitals to 147-6. The hosts got off to a brisk start – with young Shaw scoring boundaries off the last three balls of the second over. Delhi got to 36 in 4.2 overs when Shaw got himself into a tangle and miscued a pull shot to be caught at short midwicket. Delhi had three good partnerships at the top – the 36-run opening stand was followed by stands of 43 (Dhawan and Shreyas Iyer) and 41 (Dhawan and Rishabh Pant). Following Pant’s dismissal – caught at deep square leg in the sixteenth over, the hosts lost momentum when they lost three more wickets in the space of 5 runs. Delhi found the boundary only twice in the last five overs and could only add 29 runs in that period. Given that the surface was slow and shot-making wasn’t easy, it appeared the Super Kings planned to go hard when the ball was hard. Even though Ambati Rayudu perished cheaply, Shane Watson and Suresh Raina pummelled the Delhi Capitals bowlers, ensuring CSK had the run-chase under control. By the time Raina was dismissed in the eleventh over, the required run rate – which was 7.40 at the start of the innings – had dropped to 5.17. 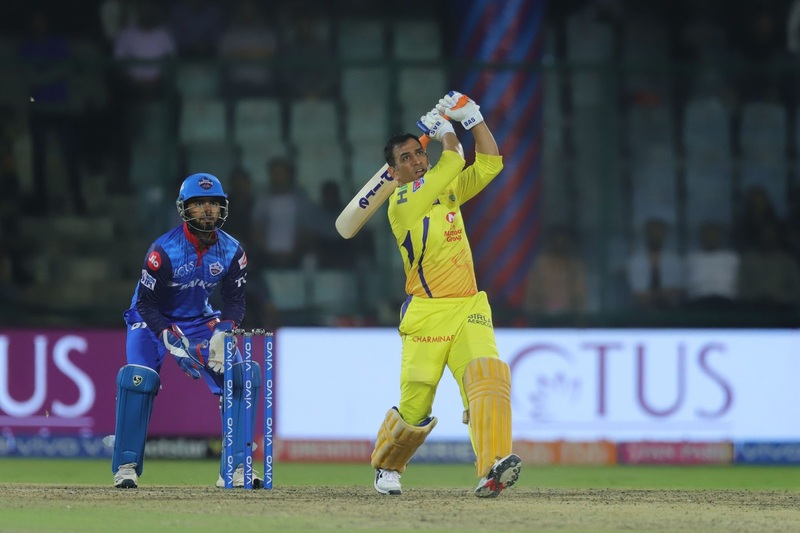 Kedar Jadhav (27 from 34 balls) and MS Dhoni (32 not out, 35 balls) added 48 runs for the fourth wicket to take CSK to the brink. Dwayne Bravo struck the winning runs off Kagiso Rabada. It takes the experience to negotiate difficult conditions and difficult surfaces. And it was two experienced batsmen who stood out at the Kotla. On a surface on which strokeplay was difficult, Shikhar Dhawan bided his time and decided to play for the long haul. On his homecoming to the Delhi franchise, Dhawan batted around the young batsmen in the side – who had the license to play freely. The left-hander was 25 from 31 balls at the end of eleven overs, at which point he began to accelerate. In the twelfth over, he collected consecutive boundaries off Imran Tahir, and repeated the act in the fourteenth over, this time against Dwayne Bravo. Dhawan brought up his half-century in the seventeenth over – getting there in 45 balls – but perished at the start of the next over; he made 51 from 47 balls and hit seven boundaries during his vigil at the crease. For CSK, Shane Watson was in punishing form; he hit four boundaries and three sixes in his 26-ball 44. The Australian was particularly severe against the spinners, scoring 23 off 9 balls off them. In the seventh over – a quiet over in most T20 matches, Watson deposited Amit Mishra into the stands on two occasions, before he lost balance attempting to play at a wide one, only to be stumped by Rishabh Pant. Suresh Raina looked good during his brief innings; the left-hander struck four boundaries and a six and peppered the leg-side in his 16-ball 30. He collected three consecutive boundaries off Ishant Sharma in the fifth over and then added one more boundary to his tally the first time he was on strike the next over. In the tenth over, he came down the track and smashed the leg-spinner Rahul Tewatia into the stands at midwicket. The left-hander looked good for a big score when his late cut was brilliantly pouched by the wicket-keeper Rishabh Pant. Even though he picked up just one wicket, Deepak Chahar was the pick of the Chennai Super Kings bowlers. The lanky pacer, who bowls best with the new ball, had bowled out at the end of the seventh over, finishing with impressive figures of 4-0-20-1. He started poorly, conceding 8 runs in his first over, but then got his radar right and conceded only 12 runs in his remaining three overs, while also picking up the wicket of Shaw. Axar Patel was Delhi Capitals’ best bowler, even if he did not have any wickets to show for his good work. The left-arm spinner conceded two boundaries in the second over of the match but thereafter bowled three excellent overs to finish with figures of 4-0-16-0. He tied down MS Dhoni in particular – bowling 11 dot balls out of the 15 balls he bowled to the CSK captain – and helped drag the match into the last over. If Chahar was impressive with the new ball, then it was Dwayne Bravo who caused damage with the old ball. Bowling the 14th, 16th, 18th and 20th overs, he used the slower delivery to good effect and finished with figures of 3-33. Bravo’s victims on the night were Pant, Colin Ingram and Dhawan. Amit Mishra collected his 50th wicket in IPL matches at the Feroze Shah Kotla ground; he became only the second bowler (after Mumbai Indians’ Lasith Malinga) to collect 50 or more IPL wickets at a venue. Chennai Super Kings: 150-4 in 19.4 overs (Shane Watson 44, Suresh Raina 30, MS Dhoni 32*, Amit Mishra 2-35) beat Delhi Capitals: 147-6 (Shikhar Dhawan 51, Rishabh Pant 25, Dwayne Bravo 3-33) by 6 wickets. Shane Watson, for his 26-ball 44.